Tourism Minister Manuel Heredia Junior and his colleague Rene Montero appear on Wednesday before the Senate Special Select Committee on Immigration. 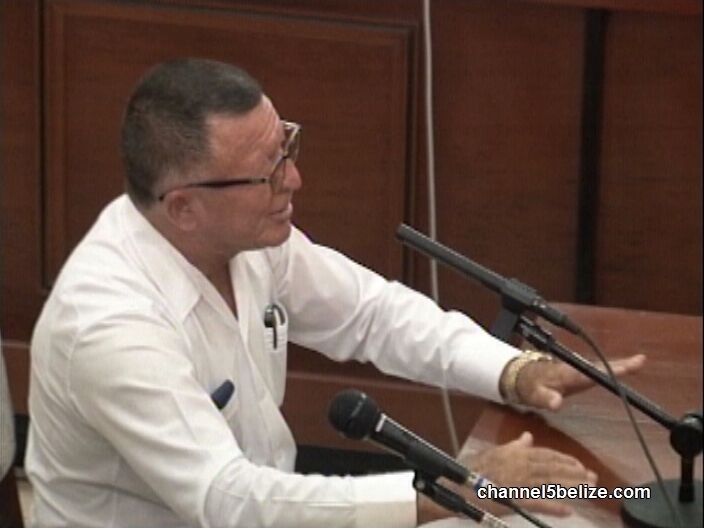 The Belize Rural South area representative is expected to be questioned about his role as a recommender for a particular family on Ambergris Caye, the Harmouch family. It is also known that he acted as a courier for the department, bringing packages of immigration documents and completed applications to the island even as an Opposition area representative. While Heredia complained to a reporter that the committee’s questioning is bordering on the political, he maintains that he has done nothing wrong. “Unfortunately, yesterday evening I received the summons to appear Wednesday over there. Honestly I believe that this has turned to be something more political than the reality, because as far as I am concerned, the Auditor General had already said that what had appeared about myself, Minister Montero and a few others, that after her findings it became clear that there was nothing wrong as to what we were doing. Our job was to recommend; if there is anything faulty in the application it is the job of the personnel of the Immigration to [check]. So hopefully this will give me a chance to be able to [show] the public, to convey the image that I have had that I always had from when I was a child until now, that I still maintain that same image, and all that I have done then, now and in the future is to serve the people of my constituency and the entire country of Belize. Heredia also noted that he was a last resort; the Department also used Tropic Air at times to fly packages to the island. He also complained that since the practice was stopped, service to the island has slowed down. Two more Ministers of Government appeared today before the Senate Special Select Committee on Immigration. From opposite ends of the country, Tourism Minister Manuel Heredia Junior and Works Minister Rene Montero both make appearances in the Auditor General’s Special Report on Immigration and Nationality 2011-2013. They were found to have made multiple recommendations for persons to receive visas, passports and nationality for which they did not qualify. In Heredia Junior’s case, the Auditor General also cast suspicion on why, since 1994, Heredia as Mayor of San Pedro Town, later area representative for Belize Rural South, and ultimately a minister, was asked to be a glorified courier for the department. While on other business, he moved packages back and forth between Ambergris Caye and Belmopan. Heredia Junior says he never succumbed to the temptation of opening or asking about the packages, and was blindsided by the revelations in the report about them. 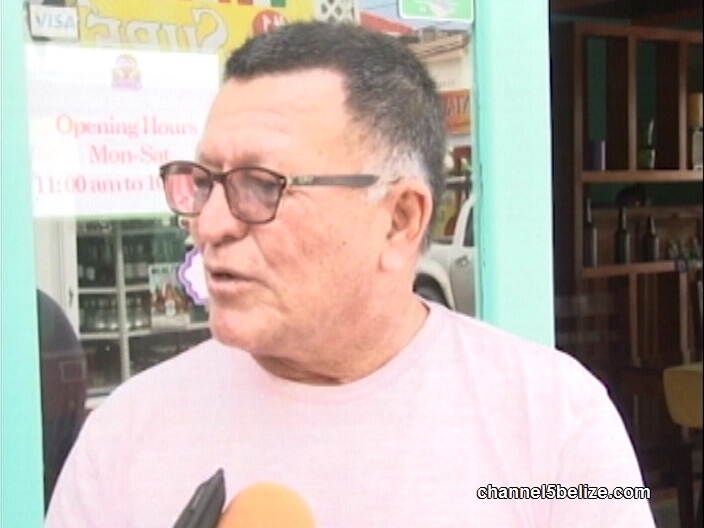 Heredia Junior says he was not paid for his work and that the practice was stopped by current Minister of Immigration and Nationality Senator Godwin Hulse, in the aftermath of the Immigration scandal. The area rep also noted in complaint that the efficiency of service to the island has dropped since the removal of the courier service. So, while Montero doesn't know any of the Harmouches, his ministerial colleague, Manuel Heredia Jr., knows the entire clan of them who live on San Pedro. He claims that there over 100 of them who live on the island. In the Auditor General's report, she has 24 pages dedicated to the many Harmouches who applied for nationality with many irregularities in their file, or the manner in which they were handled. And, Belize Rural South's Manuel Heredia Jr., is right there in the audit report because the Audit team is concerned about intervention he made to assist them to get Nationality. Some of them, from the Audit Team's perspective, did not qualify. In other instances, certain procedures were not followed when granting these applicants their nationality. Area Representative of Belize Rural South (San Pedro & Caye Caulker) Hon. Manuel Heredia Jr. in questioning at a Special Senate Select Committee Hearing. Last night's news was all about UDP Ministers Rene Montero and Manuel Heredia Jr. testifying before the Senate Select Committee. Montero's testimony was significantly shorter than Heredia's because the Tourism Minister had to answer all those Harmouche's, who he helped to become Belizean citizens back in early 2012. 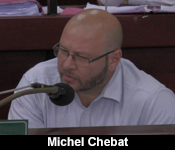 The Auditor General was concerned with Heredia's interest in the Harmouche Clan, even questioning if there was a conflict of interest between him and Khodr (Coder) Harmouche, the Honorary Consul of Belize in Lebanon. "Would it be a coincidence, sir, that within days of your intervention, on behalf of Samir Harmouche and Ahmad Harmouche, Mr. Perdomo signed off on their nationality certificate?" "Not so sir, I will never ask any one of my colleagues to go ahead and do something that hasn't fulfilled the time or hasn't been vetted the right way or whatever." "So it would be a surprise to you that they got it a few days after your intervention?" "If they get for over there then that is for the minister or the persons or who are vetting to see that it was right or if anything is wrong." "What benefit is there to you for this service?" "Personal benefit? No personal benefit from anyone; and I think I said it, why I have been very successful is because I provide services free of cost." "Would it be any coincidence or surprise to you that within a day or two after Samir and Ahmad got their nationality they went to register as voters in your constituency?" "Well, like I said, most of the people in the island, as soon as they get their - Central Americans, Canadians, Americans- as soon as they get it, two things that they do: get their ID and then get their passport." "So this was the benefit in providing this service?" "I wouldn't say that. Indeed, if they got it then it was a benefit for them because uhmâ€¦but if it didn't qualify well then they shouldn't have gotten." "No, but that's not my question." 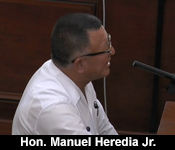 "But then don't blame Minister Heredia for getting a nationality if there were irregularities. Blame the persons that were in charge." "No, that's not my question minister. You see, there is a clear pattern established with these Harmouches. You intervened on their behalf, within a few days of your intervention they got their nationality certificate. And within a few days of getting their nationality certificate, they registered in your division, as voters in your division. And so, there was a benefit to you personally." "Well, if you want to call it so, call it so but I don't regard it as such. I think it is their duty, their rightful duty if they want to get register within hours of getting their nationality." "This was not their way of repaying you of your service?" "I don't regard, I will never and I think, probably you might not know me but your brother know me very well what type of person I am." 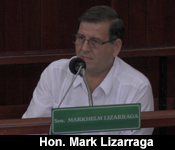 The Senators also wanted to know about the immigration courier services Heredia claimed to have been providing since 1994. As viewers will remember, the Auditor General flagged the practice when she noted that he received 52 visa stickers back on September 7, 2012. Those stickers were for the Immigration Officer in charge of the San Pedro office. "From 1994, when I was mayor of the island, right, the previous administration was in power, they had asked me if I can provide services because usually, I will come at least once a week to tend to the businesses of my constituency in different departments. So being myself, that I usually come Mondays, particularly, for the business of the constituency, immigration in San Pedro with the consent of the Minister responsible had asked me if I can take and bring sealed envelopes from San Pedro to Belmopan and from Belmopan to San Pedro. And that is what I had been doing from 1994 until Minister Hulse became the minister, and there was a lot of scandals over there, that he asked him that I can no longer continue to do the services but it was just more a service to the constituencies because San Pedro is isolated and the officers in charge will usually only come sometimes once a month and then those applications are delayed in San Pedro, it takes three weeks to a month before it arrives in Belmopan and then it takes another two to three months before it can go back to the island. That is why they had asked me if I can provide that but there was nothing that was individually it was a sealed in a manila envelope addressed to the officer in charge of San Pedro and addressed to the officer in charge of Belmopan. I believe that my job as the area representative, at the time as the Mayor, is to provide services to my constituency, the best service possible to my constituency and that is exactly what I tried to do, it is not something that I on my own went over there 'give me this' or the demand, it was something that I was asked to do. If it was illegal then I was not aware of that but it was just a service that I was providing." "Were you aware of what was in the envelope?" "Definitely not, because I will never open the envelope to see if it was visas or if it was passport or no matter what. My job was just to deliver, providing that service but I will never know what is in there. 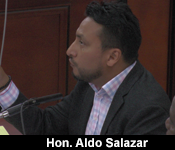 So when I saw that so many visas were taken by Minister Heredia, something is wrong here because I never knew what was inside of the envelope."